Weekdays Until 11 A.M. - Weekends Until 1 P.M.
All egg-ceptional breakfasts are served with 2 eggs, hashbrowns or diner potatoes and your choice of toast, a fresh-baked biscut or a pancake. May substitute fresh fruit. 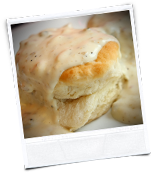 Homemade sausage gravy served over two fresh baked biscuits. All Johnny J's skillets are prepared with 2 eggs cooked to order and served on top of diner potatoes, melted cheeses, and one of your favorite combinations from below. Served with your choice of toast, a fresh-baked biscuit or a pancake. May substitute fresh fruit. Diced sausage, green peppers, onions and a biscuit topped with sausage gravy. Diced bacon, sautéed mushrooms and cheddar jack cheese. Diner potatoes, green peppers, onions, topped with a chicken fried steak and sausage gravy. Diced ham, cheddar, Monterey jack and Swiss cheese. Diced ham, 2 sausage links, 2 strips of bacon, mushrooms, green peppers, onions and American cheese. 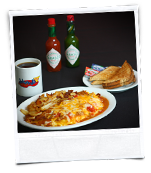 2 eggs scrambled with your choice of ham, bacon, pork sausage or chorizo sausage, diner potatoes, green peppers, onions, tomatoes, topped with green chili and melted pepper jack cheese. Served with hashbrowns. 2 eggs, chorizo sausage and refried beans, covered with pork green chili and melted pepper jack cheese. Served with hashbrowns and warm flour tortillas. Served with brown sugar, crunchy pecans, raisins and toast or a fresh-baked muffin. A banana split boat filled with crunchy granola, low-fat yogurt, bananas, blueberries and strawberries. Served with a fresh-baked muffin. Served with toast or a fresh-baked muffin. Seasonal fresh fruit and a fresh-baked muffin. 1 egg, 2 slices of bacon or 2 sausage links and a slice of toast. 1 egg, 2 slices of bacon or 2 sausage links and hashbrowns. 1 egg, 1 biscuit and gravy and 2 slices of bacon or 2 sausage links. Your choice of our original Eggs Benedict or our Country Benedict. Served with hashbrowns. 1 egg, 2 slices of bacon or 2 sausage links and your choice of 1 pancake, 1 slice of French toast or 1/2 waffle. Choose American, Cheddar, Swiss or Monterey jack cheese. Mushrooms, tomatoes, onions, green peppers and cheese. Served with warm salsa. Bacon, ham, tomato and American cheese. All of our omelets are made with three farm fresh eggs and your selection from the combinations below. 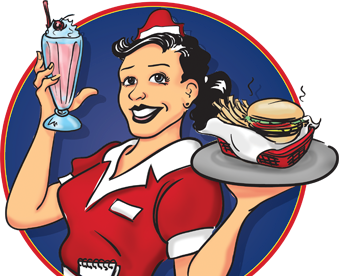 Served with diner potatoes or hashbrowns and your choice of toast, a fresh-baked biscuit or a pancake. May substitute fresh fruit. Diced chicken, pork green chili and pepper jack cheese. Green peppers, onions, mushrooms, tomatoes, Swiss cheese & warm salsa. Diced bacon, sautéed mushrooms and Monterey jack cheese. Bacon, green peppers, onions and cheddar cheese. Chorizo sausage, green chilies, onions, tomatoes, pepper jack cheese, warm salsa and sour cream. Diced ham, bacon, sausage and cheddar jack cheese. A toasted English muffin topped with Canadian bacon, poached eggs & a creamy hollandaise sauce. Served with diner potatoes. Sausage patties served on fresh-baked biscuits, with American cheese, smothered with sausage gravy, topped with 2 eggs and served with diner potatoes. Made fresh daily with real buttermilk and farm fresh eggs. Short stack of 2 or full stack of 4. 2 buttermilk pancakes filled with blueberries and grilled golden. Served with a warm blueberry compote. 2 buttermilk pancakes topped with fresh bananas and crunchy pecans in a butter pecan syrup. 2 buttermilk pancakes loaded with chocolate chips and grilled golden. 2 eggs cooked to order, your choice of 3 slices of bacon, 3 sausage links, or 1/2 slice of ham and a short stack of buttermilk pancakes. 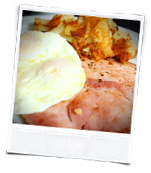 2 eggs cooked to order, your choice of 3 slices of bacon, 3 sausage links or a 1/2 slice of ham and 2 slices of our Classic French Toast. Thick slices of French bread dipped in our cinnamon custard batter, grilled golden and dusted with powdered sugar. Two slices of our fresh-baked cinnamon rolls dipped in cinnamon custard batter and grilled golden. Topped with crunchy pecans and drizzled with warm cream cheese icing. A crisp Belgian waffle dusted with powdered sugar and served with butter and warm syrup. A golden waffle baked with fresh blueberries inside and topped with warm blueberry compote and fresh whipped cream. A golden waffle topped with fresh sliced bananas and crunchy pecans in a butter pecan syrup. 2 eggs cooked to order, your choice of 3 slices of bacon, 3 sausage links, or a 1/2 slice of ham and a fresh baked Belgian Waffle.